Easy Web Gallery Builder 2.0.0.2 Extends The Character Encoding Features By Adding UTF-8, UTF-8 + BOM, Unicode – Little And Big Endian To The Currently Available ANSI Charset. 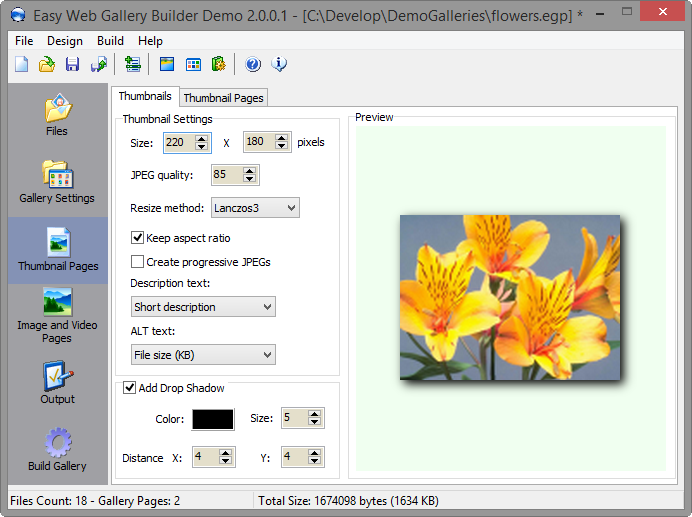 Easy Web Gallery Builder make the web gallery generation task a breeze. It saves the hassle of converting the images, resizing them and generating thumbnails. EWGB provides multiple high-quality scaling algorithms that will match even the highest demands. It supports all popular image formats and in addition to that it can process 300+ RAW image file formats. The latest version makes it possible to set the generated document’s character encoding directly inside the application. This is needed for multi-language galleries or if one needs to use a certain character encoding. There is also a UTF8 + BOM option which sets the “Byte Order Mark” inside the generated document. Tutorials on How to Create Web Galleries are also available. This entry was posted in Easy Web Gallery Builder and tagged Adobe Bridge Cc Web Gallery, Adobe Bridge Web Gallery, Adobe Output Module, Art Database Software, Art History Database, Css Design Code, Css Design Examples, Css Design Gallery, Css Gallery Code, Css Gallery List, Css Gallery Template, Css Website Design Code, Free Online Photo Gallery, Free Photo Gallery For Website, Free Web Art, Free Web Gallery, Gallery, Gallery Of Art Online, Html Photo Gallery Code, Html5 Image Gallery With Thumbnails, Html5 Photo Gallery, Html5 Photo Gallery Code, Html5 Photo Gallery Template, Image Gallery Html Css, Juicebox Gallery, Lightroom Web Gallery, Photo Gallery For Website Html Code, Photoshop Web Gallery Scripts, Refresh Style, Web Art Definition, Web Clip Art, Web Gallery, Web Gallery Software on May 4, 2017 by MindGems Support.